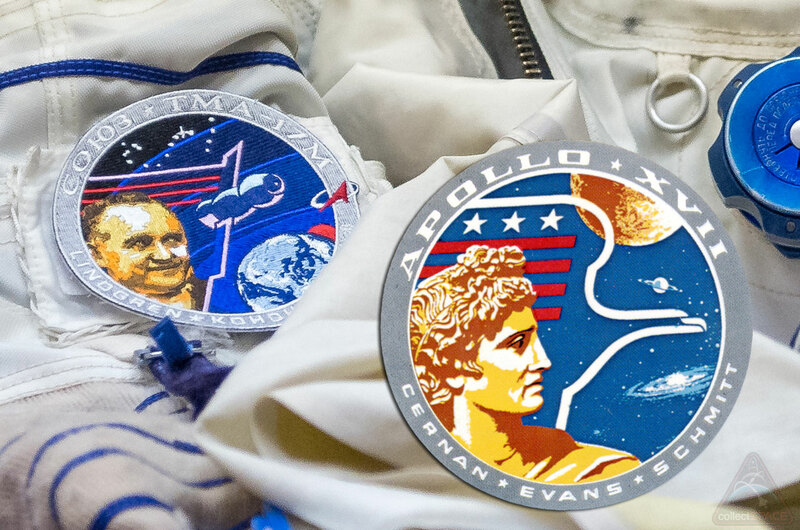 — What is blue, gold and silver and links the final manned mission to launch to the moon with the next crew lifting off for the International Space Station on Wednesday (July 22)? Kononenko, along with NASA astronaut Kjell Lindgren and Kimiya Yui with the Japan Aerospace Exploration Agency (JAXA), will each wear the Soyuz TMA-17M patch as they launch from the Baikonur Cosmodrome in Kazakhstan on Wednesday. The three crewmates are scheduled to lift off at 5:02 p.m. EDT (2102 GMT; 3:02 a.m. Thursday Kazakh time) on a four-orbit, six-hour flight to the space station. Once docked to the orbiting outpost, Kononenko, Lindgren and Yui will join the station's Expedition 44 crew for a five month stay. The U.S. Apollo 17 mission capped a race that began with Russia launching the first human into space from the very same launch pad that Soyuz TMA-17M will depart. 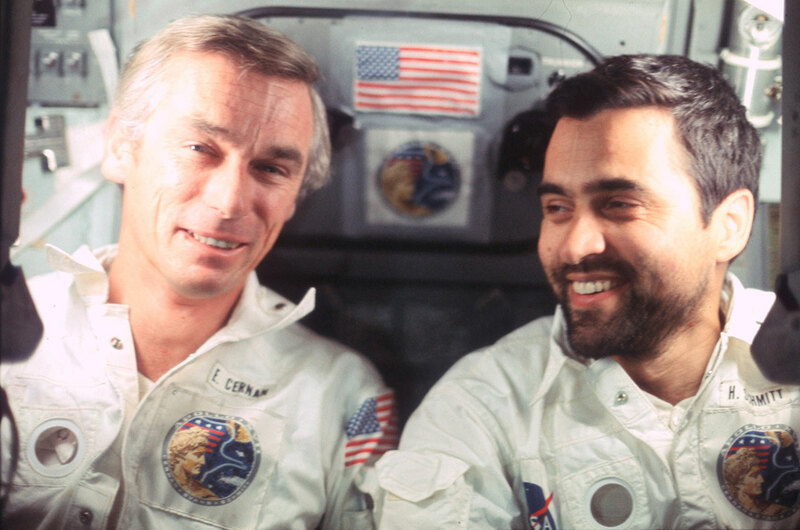 Like the current station-bound flight, Apollo 17 was crewed by three men — Gene Cernan, Ron Evans, and Harrison Schmitt. 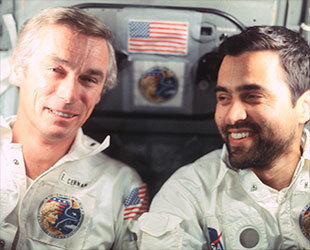 Cernan and Schmitt became the 11th and 12th people in history to walk on the moon in December 1972. 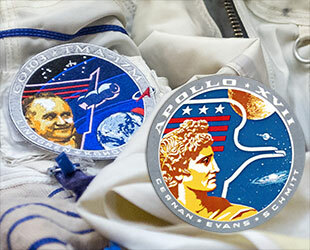 "For a mission patch, [we] turned our pen-scratched ideas and goals over to artist Robert T. McCall, who helped us come up with a wonderful design based on the themes of mankind, country and the future," Cernan, commander of Apollo 17, described in "The Last Man on the Moon," his 1999 autobiography. "The golden face of Apollo, the Greek god of the Sun, was laid on top of a contemporary drawing of an American eagle. Red bars in the wings reflected our flag, and were topped by three white stars representing our crew." "A deep blue background featured the moon, Saturn and a spiral galaxy, with the eagle's wing just touching the moon to suggest this celestial body had been visited by man," Cernan wrote. "Apollo gazes to the right toward the galaxy to imply further exploration with the eagle leading mankind into the future." Konenonko worked with Dutch artist Luc van den Abeelen and American artist Blake Dumesnil to adapt McCall's art to pay tribute to the Apollo 17 mission, while symbolizing his and his crewmates' own flight. "I replaced the moon [on the patch] with the Earth and the American eagle with the Soyuz," described the 51-year-old cosmonaut. 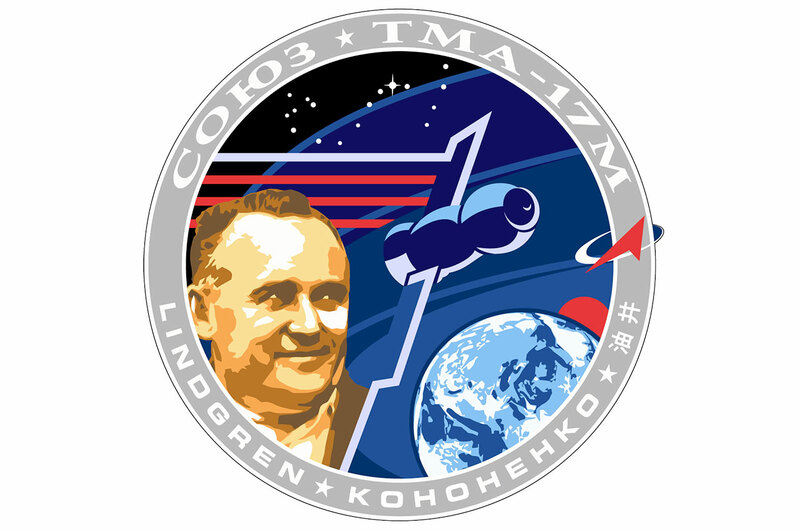 The Soyuz TMA-17M patch retained the colors and layout of the 1972 Apollo 17 patch, but instead of the Greek god, features the bust of Sergei Korolev, the once-secret "chief designer" who led the former Soviet Union's development of its early crewed spacecraft. 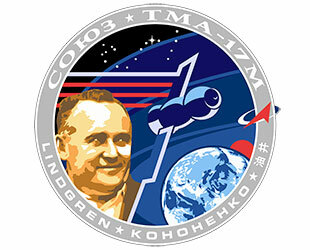 "He's depicted watching the Soyuz on its celestial voyage, trailing three red lines," the patch artists described. "They symbolize the three crew members, but also represent the three manned spacecraft that Korolev developed; Vostok, Voskhod and Soyuz." A red sun rising from behind the Earth symbolizes Japan and Yui's place on the crew. Topping off the patch is the constellation Scorpio with the star Antares highlighted. "[Antares] is the call sign for this particular Soyuz mission to the International Space Station," the artists noted.